(CNN) -- A 23-year-old man was arrested Sunday in the death of a former "American Idol" contestant, who was struck by a car in New Jersey, authorities said. Alexis Cohen auditions for season seven of "American Idol" in Philadelphia, Pennsylvania. Alexis Cohen's body was found on a street in the town of Seaside Heights early Saturday, said Michael Mohel, Ocean County deputy prosecutor. An autopsy indicated that she had suffered head trauma and multiple injuries, including to her abdomen and chest. Daniel Bark was arrested Sunday evening and is being held in lieu of $35,000 bail, Mohel said. Bark, of Toms River, New Jersey, is charged with reckless driving and leaving the scene of an accident, according to Mohel. 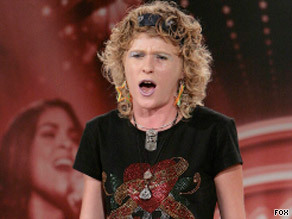 Cohen appeared in auditions of the television show in 2008 and 2009.